The former Galway All-Ireland senior football winner will be at the helm for a fifth year in 2013. 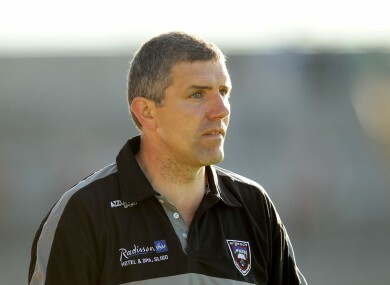 KEVIN WALSH WILL take the reins of the Sligo senior footballers for a fifth season after his appointment for the 2013 campaign was rubber-stamped last night. Sligo GAA chiefs confirmed in a statement released on the county’s official website that the decision was ratified at a county board meeting last night. Paul Durcan, PJ Langton and Tommy Craddock have been confirmed as Walsh’s selectors for the coming year while Anthony Brennan was ratified as the county’s U21 manager with the minor managerial position to be filled following a forthcoming interview process. Former Galway All-Ireland winner Walsh first took charge in the Yeats County in 2009 and enjoyed early success in claiming the Division 4 National League crown that year. In the championship that summer Sligo nearly caused a major shock in Tralee by toppling Kerry in the All-Ireland qualifiers with attacker David Kelly seeing his penalty effort saved by goalkeeper Diarmuid Murphy at a crucial stage. The following season Sligo progressed to win the Division 3 National League title and reach the Connacht final after claiming the scalps of Mayo and Galway. But provincial honours eluded them when Donie Shine inspired Roscommon to success in the decider. However Sligo have endured difficulties since then with 2011 seeing them suffer relegation to Division 3 while also losing out to Leitrim in the Connacht championship and to Wicklow in the All-Ireland qualifiers. This season they did reach the Connacht final after defeating Galway in Pearse Stadium but lost out to Mayo in the decider and then they were overturned by Kildare in the All-Ireland qualifiers. Email “Walsh to stay in charge of Sligo”. Feedback on “Walsh to stay in charge of Sligo”.